13.10.2007 – Rock Cafe, Prague – Boom Bang Baby! 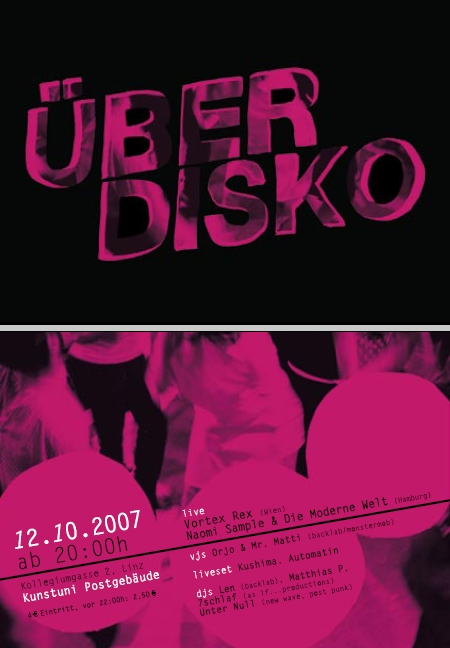 24.10.2007 – graz – elevate festival 24. – 28.10. Die Transformation einer Wiese zum Museum ist es ein langer Weg, der natuerlich ueber eine Baustelle fuehren muss. Diese besitzt weder die natuerliche Schoenheit der Wiese, noch die architektonische Ausstrahlung eines Hightechmuseums, und so hat sich der Kuenstler Karl Klar in den Kopf gesetzt, diesen Uebergang zu verbessern, zumindest fuer eine kurze Zeit. Um das geflutete Becken zu beleben, werden am Abend des 16. Septembers 500 hell leuchtende Fische ins Becken eingesetzt und bis zum naechsten Morgen im Becken bleiben. Der bunte Schein der Fische wird so die Baustelle in die Stadt der Lichter nahtlos einfuegen. Die Fische koennen mit magnetbestueckten Angeln vom Rand des Bauteiches aus gefischt werden. So koennen sich die AnglerInnen ein einzigartiges Souvenier mit nach Hause nehmen. Die Installation Lichtfischen, die der Kuenstler Karl Klar am Sonntag in der Baustelle des AEC einrichtete, war ein voller Erfolg. 350 der 500 Fische wurden erfolgreich von den partizipierenden PassantInnen herausgefischt, am Rand der Baustelle hatten beobachteten mehrere Tausend Zaungaeste das Treiben. Ein Folgeprojekt ist bereits in Planung. Photos der Installation gibt es unter www.karlklar.at/lichtfischen. Intermodem is mainly planned as a week-long international intermedia festival and workshop in MODEM, The Centre for Modern and Contemporary Arts in Debrecen, and also as a long-term network of artists from all around the world. The festival itself aims to gather together the digital branch of art, and to set the basis of a hopefully dynamically developing media art database and a virtual library. Intermodem is not an isolated, one-shot event, but hopefully the first occasion of a long-living series. The festival is planned to hold biennial and the basic theme would be different each year. The focus of this first occasion is on the diverse perception of the Central and Eastern European region, it aims to react on stereotypes, and favors every artistic approaches that analyze the connection between the so called border-awareness and identity. Therefore the main theme of the first session is ‘Borders’. According to the theme, this year we focus on the Czech Republic, Poland, Slovakia and Romania. The festival consists of two different professional parts, which are accompanied with programs that aim to popularize the genre. One of the main professional programs is the Workshop, which is coordinated by internationally reputed curators. We are going to ask five foreign and five Hungarian intermedia artists to work together during the whole week, and a competition is commenced among University students with intermedia specialization from the Visegrad Countrise for 3 other places in the team. The project will be documented and will be placed in the digital database of Intermodem (www.intermodem.hu), which will accessible through the internet during the week, and later the project will be available as an archive file. The second main professional part is a so called Virtual Workroom, which means 15 different towns in 5 continents linked up with live internet connection. Among others Havana, Johannesburg, Sydney, Seoul and Vancouver have already signed their intent to join the virtual workroom. The creating process will be continuous in the foreign towns as well, and the most active place will be visible in the wall of monitors set in MODEM. The virtual workshop is going to be finished with a real-time projection of fine works at one time in all the participant towns. During the week numerous organizers of other European festivals, and Universities that have media major will be introduced and hold lectures or show pictures about their experiences. The main parts are accompanied with many other programs. The title of one of these is ‘Intermission!‘. Based on invitations, numerous fine artists will compose objects from working or unserviceable TV sets on the spot, and an exhibition will be held. Besides that, basically, those artists and performers of other branches of art will be on stage, who aim to break the borders between genres, or use digital visual equipments in music, dance or performance arts. After the event itself, construction of a media art database is the next step. Our website (www.intermodem.hu) will serve as an open virtual gallery, and as a collection of the latest results in intermedia arts. The organizers plan to stay in contact with all the partner institutions and artists and get their works together. Continous projections in Debrecen and the other focused places will be held, and a long-term planning process about establishing a network for digital arts will start. von drones bis new wave. 1. oesterreichische Poetry Slam Meisterschaft !! !Am Freitag, den 19. Oktober 2007 geht im Wiener WUK die erste oesterreichische Poetry Slam Meisterschaft (Oe-Slam) ueber die Buehne. Die 22 besten Slammerinnen und Slammer aus allen Bundeslaendern werden sich in zwei Vor- und einer Finalrunde dem Publikum praesentieren und performen bis sich die Balken biegen und ihnen die ZuhoeererInnenherzen scharenweise zufliegen. Ein Poetry Slam ist naemlich ein Wettlesen um die Gunst des Publikums und erlaubt ist was gefaellt – gefaelliges gefaellt eher nicht. Zu erwarten ist Storytelling, Spoken Word, Kabarett, HipHopaffines, Sprachexperimentelles, Mundartdichtung, Lautmalerei, etc. etc. in Summe: abwechslungsreiche, unterhaltsame Wortfluten, Slam Poetry eben. Passende DJ-Beschallung begleitet und umrahmt den vom Verein textstrom veranstalteten Event. Also Werbetrommel ruehren und Freunde einpacken und hinkommen!